Many of us want to be environmentally conscious in our lives; it perhaps makes sense to be equally as conscious about our death. How can we be greener in the choices that we make at the end of our lives? A completely green funeral actually has to follow a lot of strict rules. These rules are all related to our impact on the planet when we die. The aim is to leave no trace and if possible to benefit the environment in some way. It is however almost impossible to fulfil all of the stipulations, there are also rules which can be fulfilled but which may not suit all families. 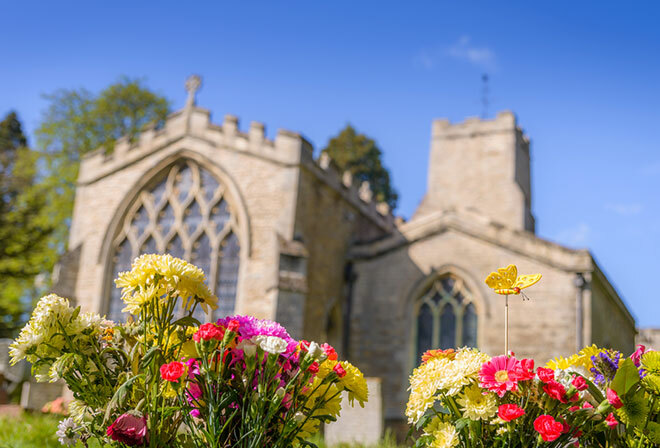 Below are some guidelines to having a green funeral, we will look at what these rules mean and how achievable they are and whether this would suit you or a member of your family. We will then look at how you can make greener choices in your funeral wishes. To Reject Cremation: The cremation process burns fossil fuels and produces many gasses inc. carbon dioxide, heavy metals and particulates. These are not good for the environment. Reviles embalming: Embalming is a complete contradiction to going green, hence these guidelines. It involves the use of many harsh chemicals and it is used to preserve a body, going green is concerned only with preserving the natural environment. Coffin to be made from local/sustainable material: The type of coffin used can make a big difference on the carbon footprint of the funeral, different types of which will be discussed later. Rejects bought flowers: The rejection of shop bought cut flowers is both for reduction in fuel miles and a natural desire not to cut plants down. Hand dug grave: The idea of preparing the grave by hand eliminates the use of fossil fuels to power machinery. Opting for a burial site that promotes a conservation purpose and Burial at a depth to allow for decomposition aerobically: The idea of the burial having a conservation purpose in that you are giving something back, being recycled. The practical side of things is very different. Firstly the law states that a body must be buried to a certain depth which then will not easily allow for an aerobic decomposition process. It may also be a problem for families to accept that they cannot visit or mark the grave of a loved one. This is why a lot of green burial grounds do allow for marking of the grave in various ways and does not discourage people from visiting, therefore finding a burial ground that can fulfil all of the stipulations is quite tricky, there are not a vast amount of them and all have different rules of what is and is not allowed. Another green option would be to have a burial in your own garden. Again this will not suit everyone. Aesthetically the green funeral is one that could be seen as almost anti Victorian and anti traditional, in their style, formality and colour scheme. This is not necessarily the case; a green funeral does not mean that it cannot be traditional or religious. In fact traditional religious services from Victorian times were often very green funerals. Most people in these times were buried in their local parish. People would walk to the service, there was no motor vehicle used and materials would be locally sourced. Often unless they were very rich there was no headstone. In fact their green credentials were pretty high. It could be considered that even today a local burial ground or cemetery is a pretty good green option particularly if family live close and would like to visit. It is possible to make choices for a greener funeral without following all of the guidelines. In the whole scheme of things the cremation process uses about as much energy as you would in one month of living or the equivalent to a 500 mile road trip. You can make green choices that at least reduce the footprint that you leave behind or off set it in some way. To offset cremation you could consider having a tree planted. 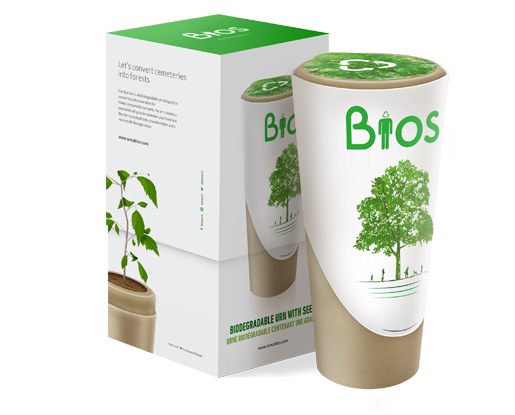 “Bios Urn” provide biodegradable cremation urns that have a tree seed inside. Once buried the seed will grow and the ashes will become part of the subsoil. Another idea for making your ashes green is from “Eternal Reefs”, who will mix cremated remains with concrete; this is sunk in to the sea where it can provide a habitat for marine life. Mimicking a natural reef. An efficient way of reducing your carbon footprint would be control of the vehicles used to get to the service. Arranging a bus for transport or make people car share. Have the service somewhere where people can arrive by public transport. This may involve having a service at a separate location to the cremation/burial itself. Another choice would be on the type of coffin that was used. The best being one that was made locally from local sustainable materials-this again is not easy as mostly we do not have a local coffin producer just down the road. We do however have some coffin manufacturers in this country and ordering from the UK will certainly cut fuel miles, particularly compared with coffins coming from China. Examples of green coffins made in the UK are Woollen coffins by “Natural Endings,” made from Yorkshire wool. They are handmade, completely natural and biodegradable. 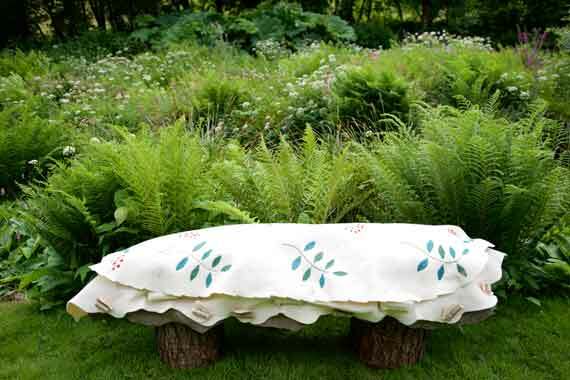 “Bellacouche” coffins are handmade from locally sourced felt. “First Feet Coffins” produce 100% environmentally friendly solid wooden coffins. Cardboard coffins by “Greenfield Creations,” as well as being affordable, have 90% lower carbon emissions than chipboard. They are 100% biodegradable and are made from at least 70% post-consumer waste. They also use corn starch glues which are environmentally friendly. It is certainly an area that manufacturers are taking seriously. It is possible but rather difficult in this country to have a completely green funeral. It is however much easier than ever before to make choices that are a lot more environmentally friendly. It is also clear that the strictest of green funeral would not suit every family. The guidelines in place can help people make an informed decision on how green they want to go. We are heading in a general direction of being more environmentally conscious both in our lives and in our death. Future generations will hopefully continue to embrace these ideas.